I was greatly saddened last month to be informed of the death of Werner Callebaut, Scientific Director of the Konrad Lorenz Institute, Editor-in-Chief of the journal Biological Theory published by Springer, Co-editor of the Vienna book series in Theoretical Biology published by MIT Press, and at the time of his death, President of the International Society for the History, Philosophy and Social Studies of Biology. I have been trying to remember when I first met Werner. I clearly remember the actual conversation and I believe it probably was at the ISHPSSB (ishkakibble to insiders) meetings at Oaxaca, Mexico in 1999. 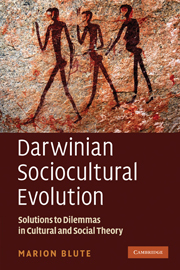 At a coffee break he came up to me and said “you’re Marion Blute” and to my astonishment he began talking about a paper I had published on “Sociocultural Evolution: An Untried Theory” in Behavioral Science in 1979 based on part of my PhD thesis! I looked down at his name tag and exclaimed “Ah, Werner Callebaut”, your book is my favourite book in the philosophy of science” and it was. The book was Werner’s “Taking the Naturalistic Turn: How Real Philosophy of Science is Done” (1993). As a sociologist I had loved the way he had studied the philosophy of science (specifically of biology) by analyzing texts and interviewing theorists. The subtitle of his book had been a playful reference to debates over realism and relativism in philosophy and the title as a whole drew attention to the fact that he was studying science studies empirically – i.e. doing “real” philosophy. Unbeknownst to Werner, I long had the idea of replicating something of his study and finally got around to it a decade later with a graduate student, Paul Armstrong. We analyzed texts and interviewed some philosophers and others who had put forward general theories of the scientific process and published the results it in Perspectives on Science in 2011. One of my great satisfactions as an academic was the pleasure I gave Werner in talking about some extensions of that work at the ISH meeting in Cleveland in 2011. He sat in the front row with a big grin on his face – so pleased that his classic continued to bear fruit. We had many interactions over the years both in person and via e-mail. We disagreed about systems theory but were both admirers of Donald Campbell. I remarked to him once that a lot of the conceptual analyses that philosophers of science engage in at ISHPSSB and elsewhere are scientifically useful and important and he agreed, adding that was why he was attempting to start a journal. I helped him out with Biological Theory, particularly in the early days, with some refereeing and other things, published a few pieces in the journal, and have remained on the editorial board and later the editorial advisory board to this day. I spent a pleasant afternoon at KLI after the Vienna meetings in 2003. In 2008 he wanted me to come and finish my book there, but with the books and papers I had accumulated for the work over the years, I decided it was impractical. In 2010 we discussed organizing a colloquia on the evolution of anisogamy (the foundations of the biological theory of gender differences and relations) which his board quickly approved but then we caught wind of a book to be published including articles by most of the people we would have invited so decided to scrap the project. Instead, I wrote an article on the topic and published it in Biological Theory in 2013. This spring in the course of communicating about a book review he wanted me to do, he sent me a long e-mail about all the things he had been up to. He was so pleased that the new KLI building was more or less complete – at least the large, noisy crane had finally been dismantled! I read his article on scientific perspectivism that he sent with pleasure and true to his habit, which he said he had inherited from Donald Campbell, whatever I sent him he broadcast to anyone he thought would be interested. I was on the ISHPSSB nominations committee when Werner was nominated as President. Although enthusiastic, I wondered whether anyone could really handle managing KLI, the journal, the book series and the society all at once. But sure enough he assembled the biggest group of people to work on various committees for ISH that we have ever had. And this is the point. Werner was not only an accomplished intellectual in the traditional sense of broad-ranging interests, but also a great colleague and a superb networker. It is going to take a minimum of at least four people to replace him functionally, but he will never be replaced to his friends.